The downside of getting paid to eat (and write about it) is not having enough time to enjoy favorite haunts on as regular a basis as I would like. Instead of weekly weekend brunches of dim sum—that parade of steamer baskets filled with bite-sized portions of a seemingly infinite variety of Chinese flavors—I’ve found myself searching for cool new spots instead. It’s great, but I miss my old favorites. 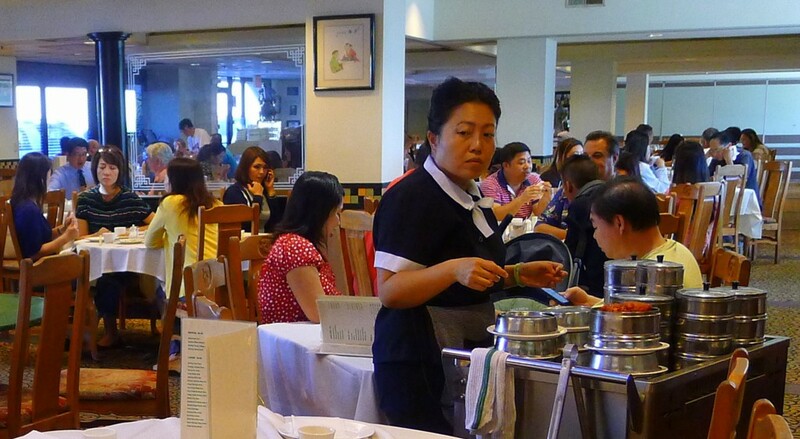 But, then, why haven’t I reviewed the dim sum at Emerald Seafood Restaurant (3709 Convoy St.) in Kearny Mesa’s Convoy District? Do I require an engraved invitation? The core of what Emerald does best coincides with the classic repertoire. Emerald’s steamed dim sum—har gow (shrimp dumplings) and siu mai (either pork, shrimp or quail-egg dumplings)—is currently the best in town. On recent trips, the pork siu mai was particularly succulent, har gow light to the point of pillowy and the fun gor (half-moon dumplings filled with pork and peanuts) was a savory texture riot. The wrappers were neither heavy, sticky nor prone to cracking. Another classic, yuba rolls filled with pork and bamboo shoots, was nearly perfect. Being light on mushrooms and bamboo shoots made it a more pork-forward dish featuring a rich, brothy sauce. The char siu bao, doughy buns filled with Chinese barbecued pork bits, was particularly good, with light, almost cloud-like buns and a filling that was simultaneously savory and sweet. Another problem at Emerald, of late, is the cost. The practice of ordering from rolling carts—part of the charm of the dim sum experience—obscures each dish’s price tag. However, the recent trajectory of the bill at Emerald is unmistakable: ever upward, more so than at its competitors. Perhaps one of Emerald’s best (and less expensive) dishes also happens to be one of my dim sum guilty pleasures: stewed tripe with daikon and scallions. While tripe is the poster child for the awfulness of offal, that meme was surely not created by anyone who tasted this dish. Neither flavorless (one bad rap) nor mineral-y (another), the tripe here has pleasant textures (different parts of tripe contributing subtle, intriguing contrasts) and a meaty, deeply umami-rich flavor profile that pairs perfectly with the chili oil at each table. The slightly thickened savory sauce, steamed daikon and slight bite of chives complete the picture. Emerald’s version of the dish is far and away the best in town; it’s probably the best tripe dish in town regardless of cuisine. And the only thing better than the pleasure of enjoying an old favorite like a dim sum brunch at Emerald is being able to write about it, too—not to mention the added bonus of being paid to do so.